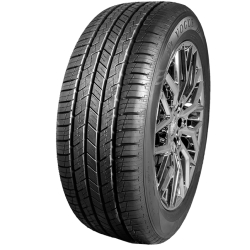 Mount Prospect, IL, April 02, 2019 --(PR.com)-- Vogue Tyre is excited to announce the Signature V Black SCT2, a redesigned all-season performance tire for the growing SUV, crossover and truck segment that delivers a superior blend of all-around performance, durability and safety. The Signature V Black SCT2’s all-new innovative tread design has been manufactured with an advanced, silica-infused compound designed for superior traction and responsiveness, as well as a Broad Shoulder Element design for greater handling confidence. Wide circumferential grooves in the tread design allows for exceptional all-weather traction and better handling in wet weather conditions. A newly designed tread pattern, with exclusive sloping tread elements and increased tread depth, guarantees quietness and longer durability. In addition to the innovative new design, the Signature V Black SCT2 ensures that Vogue’s signature Whisper TuningTM and VogueTech Comfort RideTM engineering remains intact. “The introduction of the new Vogue Signature V Black SCT2 will help our exceptional Vogue Tyre Dealers to continue to grow their sales and profits with our class leading Signature V Black line of tyres. We continue to strive to be best-in-class in everything we do and the Signature V Black SCT2 is a testament to our team delivering tyres that are emotionally compelling, fun to drive and uniquely rewarding to own,” says Greg Hathcock, President of Vogue Tyre and Rubber Company. All Vogue tyres are backed by Vogue’s Century of Craftsmanship Pledge, which includes a 60,000-mile tread life warranty and a 30-day “Buy and Try,” roadside assistance, and trip-delay replacement guarantee to enable absolute customer satisfaction. The Vogue Tyre and Rubber Company has been built upon a passion to engineer and deliver custom luxury tyres to the most discerning of customers. Grounded in the principles of quality, safety, and style, Vogue Tyre has been leading the automotive aftermarket industry for over a century. Founded in 1914, Vogue is credited with the invention of the Whitewall Tyre, a design that put the company on the map. With the growing popularity of the Whitewall Tyre, along with the booming growth of the automotive industry, Vogue Tyre and Rubber Company quickly found its’ niche in a culture that was becoming increasingly more aware of its’ identity in cars. With the introduction of the White and Gold Sidewall Design in the 1960’s, Vogue’s name became synonymous with a lifestyle of luxury, individuality and refinement. Vogue’s one-of-a-kind products and sincere, dependable business practices continue to attract a wide variety of consumers, from celebrities and professional athletes, to middle-class and working families. Today, the name Vogue Tyre and Rubber Company conjures up the image of the original Whitewall Tyre, it’s modern counterpart, the White and Gold Custom Radial, and Vogue’s newest line of high performance custom tires - the Signature V Black. Long known as the sole tyre of choice for Cadillac owners, Vogue has branched out to include a significantly wide range of applications for today's market, including the Lexus RX350, the Infiniti Q50 and the BMW 5 Series. To view Vogue’s complete product line, go to www.VogueTyre.com, or visit us on Facebook.